Can traceability of agriculture produce help agriculture and farmers ? Even after enough production farmers don’t get the fair price of his agriculture produce and agriculture produce don’t get the market & buyer. In industrial production everything is written in record and books are well maintained for regular audit & inspection. Everything is traceable if it is required. In agriculture production things are not recorded and traceable. Lack of traceability leads to many problems. Agriculture sector faces many problems like farmers suicide, bad farm loan, farm loan waiver, over production, food prices inflation, distress selling, throwing the production on road, storage problem, over import of agriculture commodities, black market selling, adulteration etc. What is agriculture traceability ? It is record keeping and mapping of the process of agriculture production to processing and reaching in hand of end user. Traceability will include the mapping of farm input supplier, farm inputs, farmers, farmers land, primary market of for agriculture commodity selling, secondary market of agriculture product selling, stockist, transporter, warehousing, processor, finish product stockist, whole seller, retailer and other point or steps involved in this process from farmer to consumer. Quality and quantity of agriculture production depends on farm inputs. If the farm inputs are properly mapped then this will help farmers to ensure if they are getting right product of right quality, they are being not cheated, their product is recommended for particular crop. Last year there was case in MP that some product was recommended for Groundnut and farmers used in soybean crop. The crop was damaged. When the farmers raised the issue of crop damage against the company and administration then company gave an excuse that their product was not recommended for Soybean crop and farmers have used applied product for soybean crop. Once the inputs and inputs seller will be mapped then by the end of harvest season, actual production estimate will be calculated. It can be also mapped with farm loans so that govt can ensure that subsidized for agriculture purpose is used for right purpose. Insurance company can also estimate the risk and loss with the help of private data. Farm input is the base record which must be mapped and recorded in proper way. Govt can also monitor if seed companies are making huge profit or cheating with farmers. Once the farmers buy the product his land his operation should be recorded and mapped. It will ensure the farmer have done right operations, type of insect & disease has attacked. How were they managed and what type of chemicals were used? If will also give an estimate that how much crop is sown area. IF will be helpful in the case of crop damage, risk calculation. It will also ensure that production is coming to local market from the local area, it is not arrived from other state or imported from other country. It will also assist banks and finical institutes if farmer have enough production for making payment or not. Is it leads that farmers are in problem then his loan can be adjusted as per the norms? It will help govt to identify the right beneficiary. This is most crucial step. If govt has to give incentive to farmers for complete mapping, then govt should do it. Farmer is the start point of agriculture food production then it will helpful to keep the whole chain (from production to end consumer) clean. Once the agriculture production has mapped then production will come in market for trading and processing. These are point of entry of external material and point to wipe out the production. 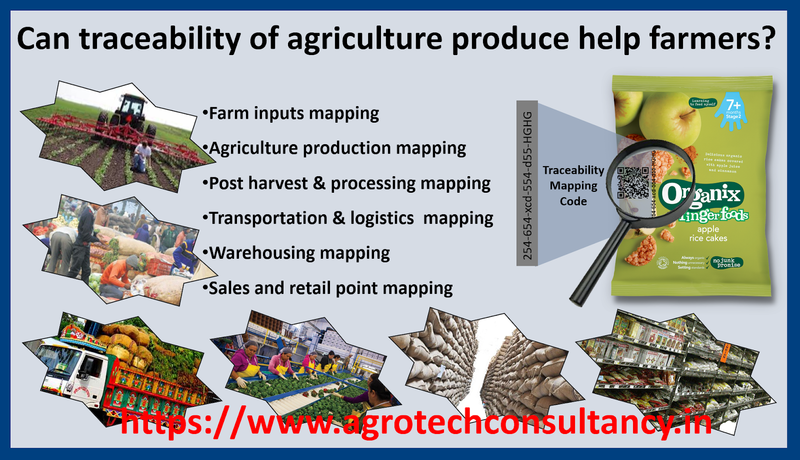 Primary market of agriculture produce is main point for mapping and traceability. After primary market selling agriculture produces normally go to processing industries and these industries are maintaining the record regularly. If will give an idea that what is farmers getting, what is industry investing in processing and what is industry getting from selling of produce. 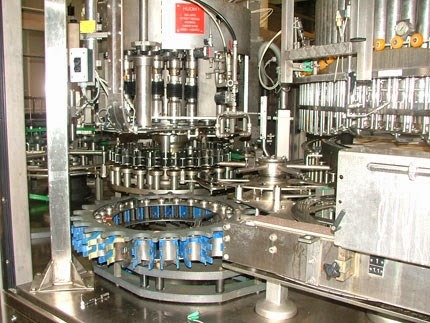 After the traceability and mapping there must be mandatory discloser of information under a code which can help end consumer that from where his product is coming, at what stage his product is processed and what type of contents/ingredients are used in preparation of his consumable product. This must be available on public website. Govt can trace the location of the produce, Illegal hording, point of adulteration, detail of stock laying at ware house, transport, processing factory and sells points, point of tax default and many more. Traceability can’t be complete solution but it can give relief to agriculture more than 70-80 %. Any extra profit is made from a channel can be shared with original producer of agriculture produce or Farmer. Farmers are fighting for loan waiver, minimum support price, high payout for their produce. If we remember the period of 20-25 back. We find that most of edible things available at local grocery shops, were in the raw form produced by the farmers. End consumer used to buy wheat and after cleaning he used get this wheat process into wheat flour from his local flour mill. Consumption of Jaggery and raw sugar was high in comparison to refined sugar. Most of spices were available in raw form in local grocery shops. Now the situation has changed we find that most of edible items are in processed form. We find very few items in raw form direct from farmers field. There are two major points, first point that farmers have opportunity to grape some part of the market of processed products and another point that farmers are paying more by purchasing the processed items as 98% farmers are Net buyers of agriculture commodities. Besides this we find a lot of imported processed items in our grocery shops, it means either we don’t have raw items to process and market or out food processing industry is not able to full fill the local demand. Here we are not discussing about precious / costly or occasional items. We are discussing just regular items which we use every day. India Produce 80-90 Million MT wheat 40-45 Million MT is processed into the wheat flour. Demand of wheat flour is increasing. Farmers are trying to sell their produce in local market as raw. In another case for example pulses. Demand of clean and graded pulses is increasing in market. People don’t have to time clean and grade it. But farmers are selling the raw uncleaned ungraded pulses to local market. End customer goes for cleaned and graded pulses. Even farmers himself purchase clean and graded pulses. There huge opportunity for farmers in local market for process and sell their items. Farmers is missing this opportunity. Due to uncleaned and ungraded quality imported processed food makes spaces in Indian market and east share in demand and create competition. Indian produce 22 MT pulses, and import around 5 Million MT pulses. Imported pulses are in ready to use condition. It is completely cleaned and graded. Indian garlic is not getting the enough price in local market, but Chinese Garlic is creating space after a lot of transportation cost from Chinese agriculture farm to Indian kitchen. This gap can be of three form, Quality, Quantity and Consumable / sellable form. Farmer can supply good quality product by cleaning and grading, farmers can produce the desired quantity as per demand of local market and in third gap farmers can process the agriculture commodity in consumable form. Farmers should be encouraged for selling of clean and graded commodity. Farmers should explore the local market and they should identify and process what they can sell in local market. Consistent quantity and quality are two major issues. IF farmers and govt can work on these issues then farmers can get good share of profit which is going to big industries and exporting countries. Profit share of regular items like Daal (lentil), Dalia (wheat), Aaata (flour), Pickle, Jaggery and other can be go directly to farmer’s pocket. Accurate data collection will boost the Agriculture. India is very rich in biodiversity. Due to it different climatic conditions. India produce a lot of agriculture crops in different climatic conditions like, cereals, pulses, oil seeds, spices, fiber, commercial, vegetables, Fruits, medicinal, herbs, meat, fish, eggs and many more. It requires a lot of data collection for proper mapping of the all crops. Data is key of agriculture development and farmers welfare. Accurate data collection will boost Indian Agriculture. Farmers are producing the over supplied crops and at the time of harvesting prices of crops comes down due to distress selling. If the Farmers are advised properly before showing about the oversupply of crop, farmer will not go for that crop. 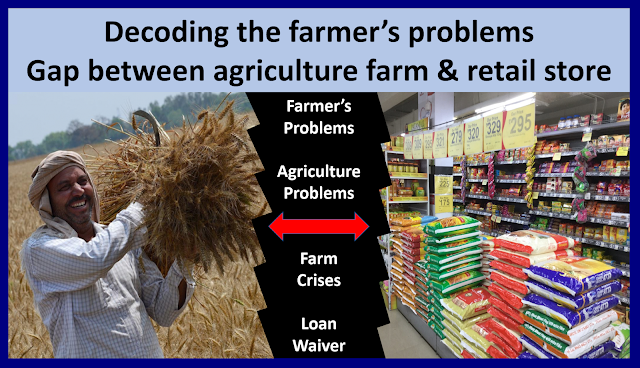 With the help of proper data collection Govt and farmers can come out from the common agriculture problems. Bad agriculture loan is becoming problem for the financial health of country, availability of the real and updated agriculture data can improve the financial health of the country. By the next general election farmers loan waiver may reach up to 2,70,000 Crore. This is very alarming figure for the growing economy. Farmers are doing suicide due to unpaid credit and poor financial problems. Farmers take the loan in expectation of better yield, goo rate and financial return but at the time of harvesting, but at the time of harvesting farmers can’t recover the cost of cultivation. Every year more than 5000 farmers commits suicides in India. In year 2004 this number was 18241. Post-harvest loss of agriculture produce in India is more than 92,000 crores. Food processing Industry in India has not developed in India to its full capacity. Indian food processing industry is 10 % of its full potential. Current Indian food processing sector is just 434 billion USD, by 2020 it will reach to 911 Billion. There is full potential for employment generation and financial growth in Indian agriculture and agro processing industry. India is importing a lot of crude oil for fuel purpose. 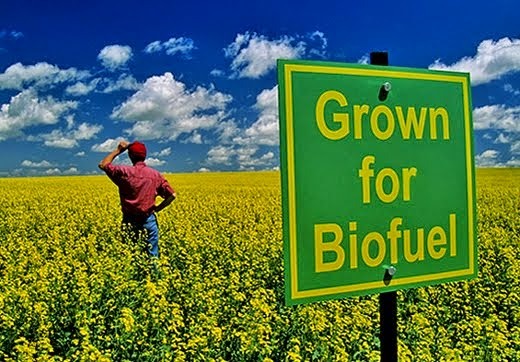 There are possibilities that petrol can be substituted by the Ethanol. Even ethanol will be little bit costlier but Indian will save a huge Foreign exchange which is used in import of crude oil for fuel purpose. Sugarcane farmers faces a lot of problems due poor demand of sugar in local and international market. Agriculture should be collected at Four level Farm Inputs, Crop Production, Processing & Marketing. All these data should be feed/collected on single platform. Availability of authentic and correct data will lead to good decision making and proper planning. Collection of authentic data is also base of the agro processing industry and further export of the agriculture products. We can decide the estimated production potato by the available of selling of chemical used in seed treatment of the seed potato. These data collection will help farmers, farm input companies, financial institutes, agro-processing companies, agro warehousing, government. India can control the agriculture import bill, which is more than 1,20,000 Crore Rupees. 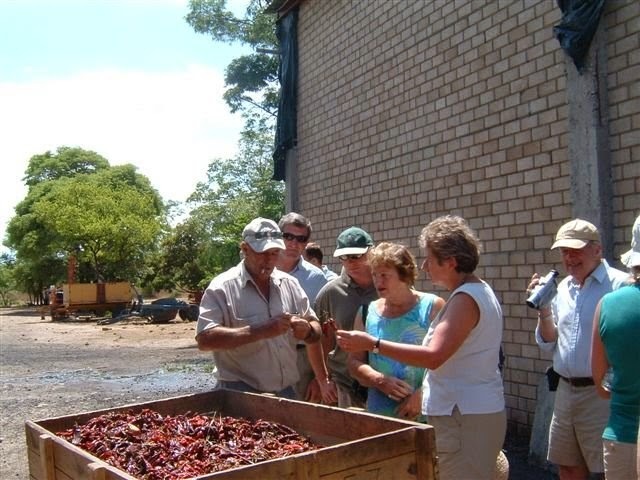 Farm input is the first point to start the agriculture production. 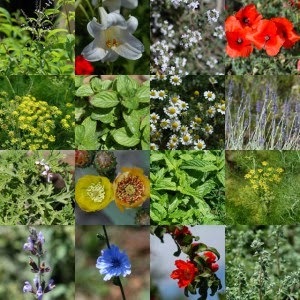 Farmer purchase seeds, plants, fertilizers, power, fuel for agriculture production. Once the farmer starts the sowing then it will give the basic idea about the yield output after a certain period in normal condition. It will also give a basic idea about the attack of disease and insects. Agriculture finance and agriculture insurance must be strictly linked to the available data so that farmers should not face any financial hurdle. It will ensure that farm loan is used for farm production only. Farmers will be also protected from the inferior quality farm inputs and seeds. Farm input retails and farmers both can feed or collect these data. This will be the actual data of crop production which will be collected from the farmers and the Agriculture commodities buyer. These data are very important for the further planning of the agro-processing and emergency planning if there is shortage of in future food supply. Over supply can be addressed by the additional processing or export of the commodity with incentives. Annual collection of crop production data will give an overall all picture of the crop production potential of the country. Country will explore the potential of the agro-processing, ware housing, cold storage, logistics, international trade, Value addition. These are important real financial data which will make agriculture, financial strong. These data will give an idea about that how much quantity is used in raw form? how much quantity is used in processed form? how much quantity is exported? what are value addition in basic price of commodity? 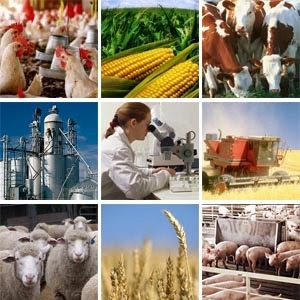 Processing and marketing convert the agriculture production in monetary terms. Which make the agriculture sector prosperous and it will lead to welfare of farmers. Before 5 years agriculture data collection was a big hurdle. After the arrival of the latest communication technology and advance mobiles/ input devices it has become easy. Govt can take extra step for welfare of farmers for the real time monitoring of crop production data. In the condition of crop failure farmers can prompt assistance from the govt of any concerned institutes like Insurance, Co-operative. In today word data are real asset of any govt or industry. It will help govt to explore the new potential for Indian agriculture. 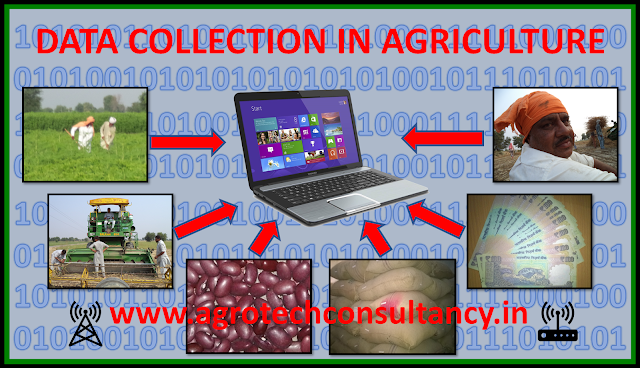 Accurate data collection is way to success for Indian agriculture. India is major agriculture economy of world. Agriculture is major produce of agriculture commodities. India is also a major consumer of agriculture produce. At one side local producer are not getting the enough return from their produce at another side import of agriculture commodities are increasing in India. Indian is importing agriculture produce of 1,15,434 crore (2014-15-NFSM) Indian Rs. The number may have risen by 2018. Indian is exporting agriculture produce of 2,39,454 crore (2014-15-NFSM) Indian Rs. The number may have risen by 2018. As per data of USDA India has imported agriculture commodities of 16.9 billion USD or Rs 1,18,300 Crore in year 2016. Mainly India import What, Pulses, Treenuts, Cereals and Edible oil (palm oil, soybean oil and other vegetable oil). These figures show that India is not self-sufficient in food production. AT another side farmer don’t get the market for his produce and he throw his produce after distress selling. Recently our Prime minister set a vision of doubling the Indian farmer's income by 2022-23. After analyzing the factors, it is not a day dream. We can achieve this vision of doubling the farmers income. We have largest cultivation land in world, We have market to consume our produce. We must study the fundamentals and We can achieve this target. Indian agriculture productivity is very low in world. There are chances of improvement in productivity by 2-3 times. Efficient uses of farm inputs, natural resources, improvement in varieties, mechanization of agriculture, control of post-harvest losses. India have a large agriculture land, there are two-three cultivation season, different climatic zones. Indian have largest population of cattle. But still milk productivity in India is very poor. There huge scope of meat, production egg production. India has very long coastal line, there is huge potential of fish production and export. Indian need to explore natural resources to its full potential up to sustainable levels. For example; as per World Bank Data Global cereal productivity is 3967 Kg/Hectare, while productivity in India is 2993 Kg/Hectare. Cereal productivity in china is 6029 Kg /Hectare, in USA 8143 Kg/Hectare in Europe Europe 5363 Kg/Hectare, in this example of productivity of cereals, India has huge space to improve the productivity. Same facts are with other agriculture produce. In depth study we find that we have production, but we don’t have infrastructure and industries for post-harvest handling of agriculture produce. Farmers throw the Onion, Potato, Tomato, Sugarcane on road. Nothing should go to road. Good should be come out from farm and everything must be processed or stored. In a civilized society it is not justified that food is thrown on road and at another side hungry citizen is sleeping on road. Potato can be dried, tomato can be dried, Onion can be dried but it doesn’t make any sense if farmer throw it on road. In first step few value chains can be established it can be studied and these chains can be replicated. This will generate the new employment in rural area. If it is potato grown area than every potato must be processed. Quality of Indian agriculture / products are not as per international markets. There must be homogeneity in quality, produce should be bold and beautiful, Nutrition value of agriculture food production should be improved. Quality food production will give good value to farmers, it has long self-life, it is easy to process. Importance of quality should be explained to farmers so that inferior quality should not come out from farm. Even in distress selling condition good quality fruit and vegetable get higher rates than market price. It is also easy to sell the quality material. India is rich in agriculture biodiversity. We have many cultivation climatic conditions, We have different regions, we have different crops, we have different varieties of a particular crop. Govt should promote local dishes, local food, nutritional value of local crops. 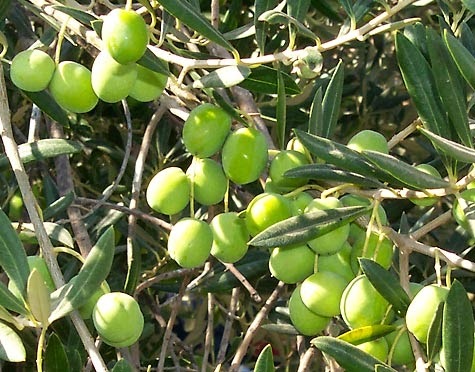 We have seed that since last 9-10 years there is huge promotion of Olive oil on health ground, on cosmetic ground. major food, TV channel, major Food program, famous chef is cooking the food in olive oil. What is this? This is simply any introduction of new edible oil in Indian kitchen. We can run these long term program and create an awareness among people about our local food / food on health benefit ground, taste ground, food supplement any other way. Local produce will find the market and import of agriculture produce will be come down. Govt should also promote health hazards of imported food items. Ultimately the benefit will go to the local farmers. Govt should consolidate the non-economical size of marginal and small size land. The existing owner should be backed with assured employment in agro processing industry or social benefit with assured income to very family. Land consolidation is very important in increase of agriculture production. Fix cost will be come down, production will increase, and profit will increase. Price fo agriculture produce will come down Indian market will become more competitive for imported agriculture commodities. MSP plays a major hurdle of the market it disturbs the normal economic cycle of Agriculture cycle production. It also gives support to commodity price at lower side. It makes a space for imported agriculture commodities. Market backed price will lead to the judicial production of agriculture commodities. Farmers will not produce the over produced Agriculture commodities. Demand and supply will be balanced, and farmers will not face the problems of distress selling. Resources will be utilized in non-economic production of agriculture crops. Every farmer doesn’t get the benefit of the MSP. It increased the dissatisfaction among the farmers. Power centric farmers use these benefits. Benefit of MSP don’t go to farmers, but effect of MSP is transferred to the consumers. After the selling the commodity by the farmers processor process the produce and it reaches to end consumer. Due to price inflation, value addition any profit made by the value chain cycle, after a level must be goes back to the producers. In the cases of vegetables farmers sell it at very low price during the good crop production season but processed food items are always sold at fix. price. Farmers will not come under pressure of distress selling. He will have an opportunity to make money even in the condition of distress selling. Govt should conduct the study of major market for Indian agriculture commodities. Govt should work on local processing instead of export of raw material/ commodity. Govt should establish the tough food standards as per the international market. So that Indian should not lose the opportunity of processing of commodity. This will generate the income for local processor. Special in China, USA, Russia, Europe have only one cropping season. India can supply the fresh fruit, vegetable and other agriculture produce to these countries during the winter period. Instead of assistance / waiver Govt should invest in technology up-gradation. In the cases of waiver of assistance money goes to the corruption and it doesn’t not reach to the right beneficiaries. Govt should invest money on agriculture market infrastructure development, Storage development, processing development. Today world is moving toward the precision farming, block chain technology, automation of agriculture operations, soil less farming. The loan waiver and financial assistance amount will open the door of new employment opportunity. 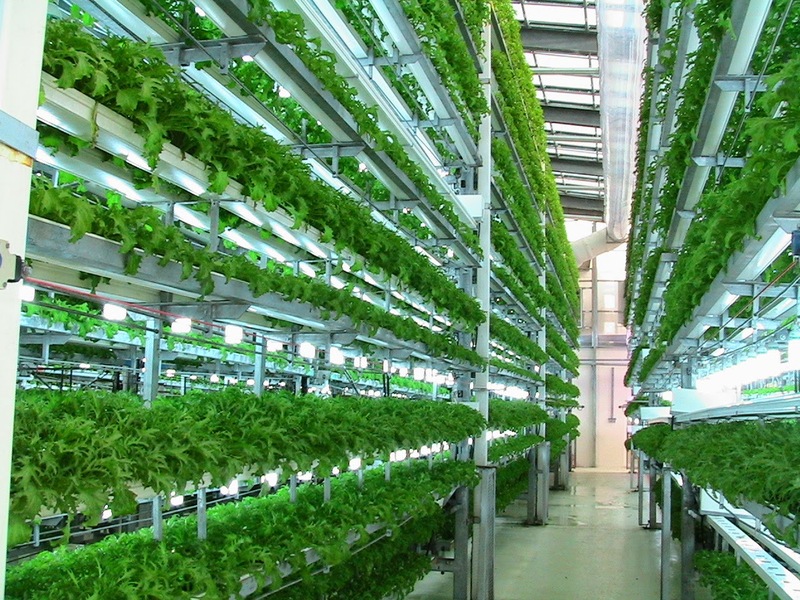 New technologies will come in market and cycle of agriculture finance will not break. It will satisfactory for the honest farmers and traders. Promotion and consumption of processed agriculture food. Govt should promote the processed food. Fresh food has short self-life, more handling, transportation and marketing cost. Processed food will give the new employment opportunity to the rural youth and entrepreneur. Prices of processed food are stable, and consumer can be safe from the immediate inflation of the agriculture commodities. 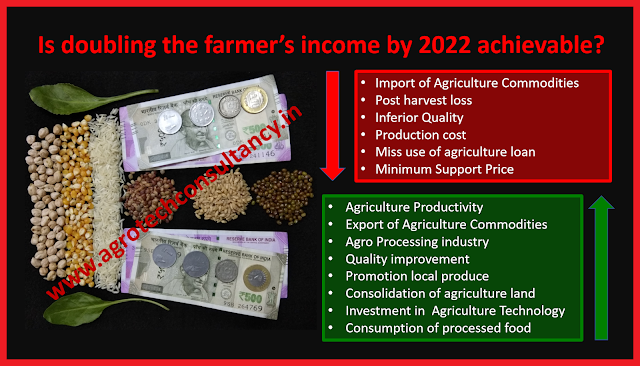 There are many other steps that we can increase the income of Indian farmers. Annually 1,18,000 Crore import bills is not a small amount. With judicial decision and long-term steps this amount can be go to the pockets of Indian farmers. If we will not do then imported item will increase the share in Indian market. That will be additional loss of forex, local employment, loss of income of Indian farmers. Who will pay the cost of political loan waiver promise ? In democracy election of representative is the backbone. Political parties use this process to keep themselves in power. Now a day’s political parties are making false promise to attract the segment of the voters for mass polling in favour of their candidates. Before 2000 poverty eradication was a general issue among public for political promise. Now political parties have segmented the poor in different vote bank like dalit, backward, minority, women, farmers. These parties are making different promise to attract the voters. Due to lack of long-term policies farming sector in India is facing a lot of crises. In some state’s agriculture production is not good. In some states production is not getting enough market support due to lack of marketing infrastructure. Ultimately small and marginal farmers are not making enough profit even after good crops. Govt provides agriculture loan for farmers on subsidized rates with easy term of return. Political parties are using the tool of farm loan waiver. These false promises are making the farmers greedy and promote the to not pay. Once the parties get the power with these promise then they try to bypass the promise like a half-cooked dish. They put a lot of terms like, limit of land, limit of waiver amount, type of bank and so and so. Parties knows it very well that they will not able to full fill the promise, but they use this strategy to come in power. 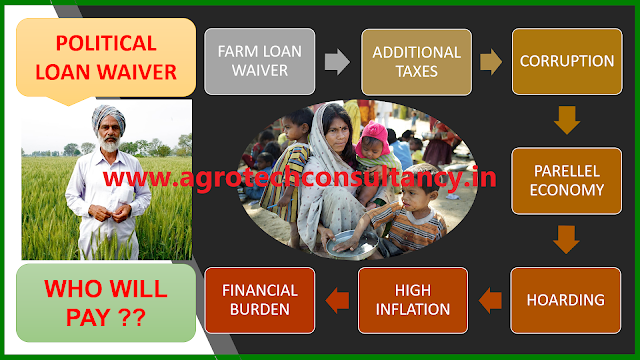 Mass loan waiver is not economically viable step of agriculture industry in short term and long term. Ultimately the economic burden come back to farmer and poor. Govt use a lot of financial resources to complete the promise. Govt puts a lot of additional taxes to cover this revenue loss. Govt increases the taxes or cut the expenditures of the long terms’ schemes. These taxes are added back to the final prices of the good used the consumers and step by step this financial burdon reaches to the poor. It increases the inflation rates. Inflation leads to increase the living cost of poor. Living expenses of poor increases. More than 90% farmers are having small and marginal land. Most of these farmers are poor. Agriculture loan are given against the mortgage of agriculture land. Small and marginal farmers don’t have big land, so they don’t have much access to agriculture loan, Sometime title of small land holding is not clear or there are more than 2-3 owners. Bank don’t give loan due to documentation problems. Ultimately this loan waiver will not benefit them. There is one another category of farmers who take the land on rent and do the agriculture. Generally, these farmers are known as land less farmers. They have also not access of the agriculture loan. Above two categories are very important category for agriculture production and food security. This loan waiver will not also benefit to tenant farmers. Big farmers have access to agriculture loan easily. They have big land holding and their land titles are clear. These farmers have good profit from agriculture since the fix cost are very low. This category of farmers is political influential category. These big farmers are also part of local power. In some cases, it was seen that they rent their land to land less small farmers. They take loan from bank even after they are not doing agriculture. They take the loan from bank and give this loan on credit to land less farmers at market rates. This market rates are more that 5-6 time higher than the institutional agriculture loan. If some farmers want to play safe, then they withdraw the agriculture loan and re-invest it in bank as Fix Deposit. In worst and safe case, they are earning 3% - 5% interest. Once the govt change then these farmers get benefit of loan waiver. This loan waiver cost is born by the poor farmers and land less farmers. This loan waiver doesn’t help the category of farmers who need it. Instead of this loan waiver Govt should invest in market infrastructure, storage, processing. With these steps post-harvest losses will be come down. Self-life of agriculture produce will increase, farmers will have easy access of market. Farmers will safe from the condition of distress selling or over production. These practices will generate the new employment. Excess production will available for export. It will increase the income from agriculture production. In the condition of excess production and distress selling, farmers throw the commodity / produce on road. With in one-two month farmers purchases same produce at 10-20 time more cost. Economic point of view loan waiver breaks the economic cycle of the agriculture industry. Money doesn’t return on time to the source. In some cases, it was also seen that agriculture loan goes to lifestyle expenses, non-agriculture needs of farmers, or some other head for which agriculture loan was not sanctioned. Farmer organization, farmers, civilians should arise voice against these non-economical steps. If the money will go to long term investment, then it will be beneficial for whole industry an stake holders. 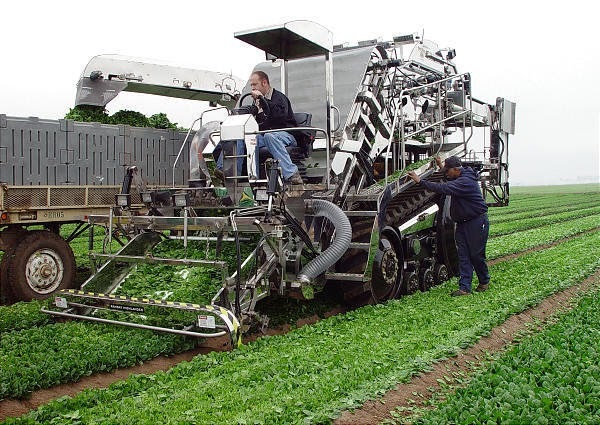 Today word is moving toward the precision agriculture, automation of agriculture, soil less farming, urban agriculture. If we will not invest in right direction then our market will be flooded with the imported food items. It will be disaster for local Indian agriculture and not one will spare. We are leading Agro Technology and Agribusiness consultancy provider. We strongly believe in business ethics. 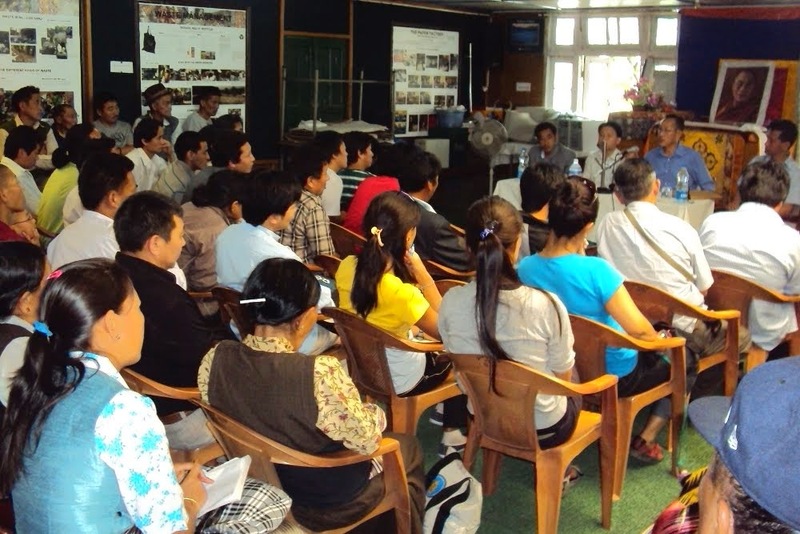 We have highly professional team of subject matter specialist of agriculture and allied disciplines. We believe in truly consultancy with independent and profitable solutions. For us agriculture is the base of development, height of development, strength of development, depth of development. For a long term sustainable social & economical development agriculture must be the axel. Agriculture development must environment friendly, sustainable, efficient use of available resources and non hazardous. Copyright Agrotech Agriculture Consultancy. Simple theme. Powered by Blogger.